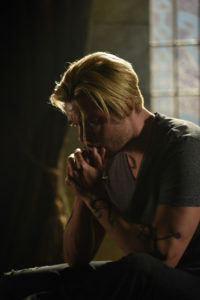 Jace is under the control of Lilith on Freeform’s Shadowhunters as “The Owl” is on the loose, and this is going to cause drama for the rest of the characters on the series which airs Tuesday nights on the Freeform cable channel. 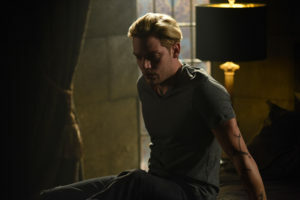 Late last week, we caught up with Shadowhunters actor Dominic Sherwood (Jace) about what to expect moving forward, including some talk about some burning questions that fans of the Mortal Instruments-inspired TV series have had. Tonight’s episode is called “A Window Into An Empty Room” and you can find some photos from the episode here. Find all of KSiteTV’s Shadowhunters interviews here! KSITETV’s CRAIG BYRNE: When you start with a new season of Shadowhunters, do the producers give you an idea of what the arc will be, or was the whole storyline with Lilith and The Owl a surprise to you? DOMINIC SHERWOOD: It was a total surprise. It’s funny; I didn’t know I was playing The Owl until like three weeks before we got to Toronto for Episode 1 and 2. I wondered “what’s going on there?” And they went “oh, that’s you! You’re playing The Owl!” That changes everything. Didn’t know. Got it. Wicked! So, yes and no. There are some things that they share, and there are some things that are left to our surprise when we read the scripts. But pieces, yes. After finding out about The Owl, I found out about the relationship with Lilith and what was going to happen. We tend to know two or three episodes in advance what’s going to happen. As an actor, how does it feel to play a character that’s under someone else’s spell? It’s interesting. We actually put a lot of work into it, because what they wanted was this character that’s this possessed sort of Owl creature wearing Jace’s skin to have access to Jace’s memories and mannerisms so he could perfectly fit in with Jace’s friends and family and be this sort of perfect infiltration creature. It was difficult because it has to be just enough difference for the audience to see that it’s not Jace, and not enough difference for all of the characters that he loves and loves him to not see that there’s something wrong with Jace. Will we have to wait long for Jace to find out that Clary went to Luke’s sister behind his back? That’s an interesting one! I don’t think we really look at it. It seems fairly normal that Jace says “hey, listen, don’t do this” and Clary just does it anyway. We just ignore it; it’s just what happens now. It seems that Jace a lot more respect for Simon that he probably would like to admit. Do you think they could actually be friends? Look. Now here’s the thing with them. I think that theirs is a slightly more complex relationship. I think their relationship is fairly common in real life. You know, just because they’re not saying “I love you, you’re my best friend” every minute of every day doesn’t mean that they don’t care about each other. It just means that it’s subverted with layers of potentially pride or distaste or disinterest or whatever, but it doesn’t mean that they don’t care about each other. In fact, I think they care about each other immensely; it’s just sort of hidden. I think that relationship, especially because we’re not spoon-feeding the audience what it is – which is sort of the case with the relationship with Clary and Jace, it is very “I love you, I love you too” – and there is nothing sort of in the subtext. 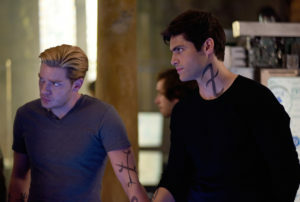 Whereas with Jace and Simon, there’s a huge amount of subtext. They share this huge secret between the two of them, that Jace saved Simon’s life and Simon promised to keep it a secret, and so on and so forth. So I think they care about each other hugely. 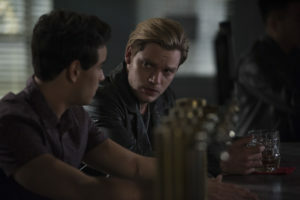 It’s a love-hate relationship that they both know that if it really came down to it – and as much as it can be funny on screen, the reality is if it came down to it like it did halfway through Season 2, Jace would be happy to put his life on the line for Simon, and vice versa. Last week’s episode also had a really good moment with Jace and Alec. Again, the Lilith of it all might throw things off, but will we be seeing their parabatai bond strengthen again? I hope so. What we found the deeper that we go into the storylines is that the relationships have seemed to take control of both Jace and Clary and Alec and Magnus – those relationships seem to be fairly fundamental in their world, which is a shame because as you say, I think the parabatai relationship is such a beautiful bond. A “brothers in arms” sort of thing. So I hope so. I hope we revisit that more. We’ve just shot some stuff toward the end of [Season] 3B where we do see that relationship more like what Matt and I have been working on. It’s almost like that twins ability that someone walks into the room, and you can be on the other side of the room, and you can just feel that there’s something up with your twin. So we’ve been playing that kind of idea, especially in 3B a little bit more, working with our relationship a little bit in the subtext. We’ve been playing with that idea to reinvigorate the parabatai relationship a little. How will the others respond once they find out that Jace is The Owl? Not great! I think everyone, including Jace, would be so surprised to hear this news, especially because we never really see how it happened, originally. We don’t see how Lilith has managed to get her grasp of Jace. I think that was an intentional thing from the writers’ room to keep everyone in suspense; otherwise it would have been given away from the start. But I think the fact that it was such a surprise will send everyone for a loop. The team’s taken a hit from it, because it’s one of their own. At the end of Season 1, Jace sort of goes off with Valentine, but that was to save the others and make sure nobody got hurt, so it’s not him doing its job. He’s succumbed to the Dark Side, essentially, to sort of Star Wars it up a little. What the book fans will know, but potentially not the TV show fans, is when Shadowhunters are born, they are protected. They are sent to either the pretty ones or the creepy ones, I can’t remember, it’s one of them… and they’re given a protective aura, and obviously when Jace was brought back having been killed at the end of Season 2, he wasn’t given this protective aura, and that is what gives the ability for him to be so susceptible to this kind of possession. Now, that been said, book fans out there who are just taking in that information: Just be aware that there’s more to come. There are some more twists that you might not expect. I promise you. What else can fans look forward to in the coming weeks that you’re really excited for them to see? We have some pretty all-out action towards the end of Season 3A, the first half of Season 3. There’s some pretty gnarly stuff with Luke and Isabel and myself and Alec — oh yeah, that’s gnarly! — there’s a lot of stuff that happens between the heroes and with all of the heroes that you’re not going to want to miss. We’ve got some huge sequences with big CGI demons which is no fun for us to film, because there’s nothing there, but I’m sure it’s going to be fun to watch. We’ve got a big, pretty climactic ending to 3A which I’m excited for everyone to see. Shadowhunters “A Window Into An Empty Room” airs tonight (April 24) at 8PM on Freeform. Take a look at some preview photos from the episode here!